Day 13-15 in Palestine – YALLAH! You All Are Hackers. The first day of our exchange without a meeting with the entire YALLAH group began and each project group had its own ways. 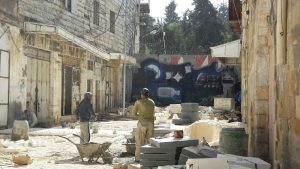 On that day, the sun was shining and a pleasant breeze was sweeping through the streets of Ramallah. Enjoying the weather, our project group made its way to the administrator (He’s volunteering) of the youth centre in the refugee camp al-Amari to discuss our plans and project ideas. He became really enthusiastic due to the thoughts of integrating art to a computer club workshop. Considering this, he even offered to write and spread an announcement for the children across the refugee camp. Shortly before the end of the conversation, the dean of Uni Siegens’ “Faculty of Economic Disciplines” Volker Wulf, his wife Mika and his scientific research assistant and PhD student Konstantin joined. Also they seemed to be fascinated by the ideas. After this major step forward for our project, we walked to the restaurant Abu Hammam. Though to get there, we had to cross an incredibly crowded market. From all corners, pitchmen shouted out their daily offerings for everyone to hear. For us Germans who are not used to this, it acted more like a deterrent than a temptation. At Abu Hammam, we enjoyed delicious traditional Palestinian meals for little money. We headed home around 4 o’clock to work on our field notes for the rest of the day. Suddenly, we were informed of a protest in the centre of Ramallah. Palestinians demonstrated against the killing of an activist by Israeli soldiers. When we arrived home, we tried to inform ourselves of the incident as the demonstration would only take place at 5 o’clock. At 5 o’clock al-Manara square – the main square of Ramallah – was not yet packed with protesters. We guessed that the organizers could not mobilize people in such a short time so we were wandering around the shopping malls instead. Maren, Patricia, Somaia and Gregor were with Melissa and me, when suddenly a crowd of people drew our attention. They were demonstrating against the killing of the activist Basel al-Araj who died in the night of March 6th. Following the demonstrators, we were surprised how so many people were able to gather spontaneously. Protesters were hugging and crying or screaming out in pain helplessly. Melissa and I joined the masses entranced, tears welling in our eyes as well now. For us it was sad, but also beautiful to see so many people standing up against the killing of a single person together, comforting each other. After coming back home, we talked about the experience and how it has moved us for a long time. By the 7th of March, we were in Palestine for two weeks and we would also stay for another two. 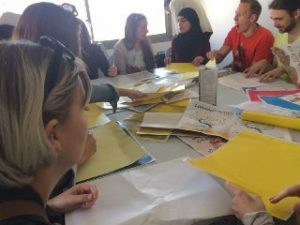 On that day, we visited a workshop of the Disarming Design of Palestine Initiative in Ramallah. Three artists and designers presented their products to us of which each one had a special meaning related to Palestine. The entire team of artists aimed to spread alternative narratives regarding contemporary Palestine and tried to reflect upon the role of creative practices in situations of conflict. For example, they designed a wooden box in form of the region Gaza to symbolize the feelings of the inhabitants of the Gaza Strip who are neither allowed to leave the “box” nor able to fit into this limited space which is smaller than the German city of Cologne, but populated by about 2 Million people. In addition to this, the artists showed us a ceramic plate depicting distance markers to Gaza. For example, one plate showed the distance between Ramallah and Gaza which is only about 97 kilometres. We recognised that Gaza is not far from us in Ramallah, although we also could not reach it due to the closed borders. On the one hand, this showed us the close distance between Ramallah and Gaza, but on the other hand, we realised that – although we were right next to Gaza – we would not be able to enter it and get to know the life there. Then, we walked to our beloved Abu Hammam again – the restaurant with the best prices we had gotten to know so far (no covert advertising intended ;P). Afterwards, we went back home because it suddenly got quite cold and windy. In the evening, we met Anne Paq, an activist and photographer, and went to Ziryab with her to have a shisha and hang out. Anne already told us that especially al-Khalil (Hebron) might become a very emotional experience for us and tried to prepare us for it. All of us got up very early because we started our trip to al-Khalil (Hebron) at 8:30 am. Anne and Renad, a participant from the last YALLAH exchange, joined us. It took us a long time to arrive in al-Khalil (Hebron) and we saw a lot of Bedouin camps during the ride. We also had to pass lots of checkpoints. One of them was closed, so we had to take a detour which added about 30 minutes to our overall travel time. The sun was shining the whole day and a friend of Renad came to us and took us to a restaurant where all of us had a great breakfast. 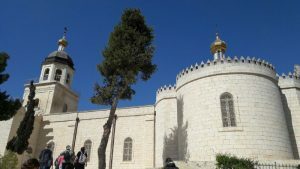 After that, we visited a church in al-Khalil (Hebron) and got to know two lovely Palestinian children who walked with us through the church and its surrounding area and played games with us all the time. We came to the old city of al-Khalil (Hebron) and went through the market place. Here, the sellers were a lot more obtrusive than in Ramallah or Nablus. On the walls, we could read the plea “FIGHT GHOST TOWN” and we could not understand why someone had written this on a wall because the streets did not look like a ghost town at this time. Above the market street, a net stretched between two houses to protect the people on this street from stones or trash. We could see an Israeli military watchtower right above us. This confused us because just like the area guarded by checkpoints we had seen on our way between cities al-Khalil (Hebron) is part of the Palestinian West Bank. Shortly after that, we went to a gate at the border. Beyond the border, we could see a lot of Israeli flags and above the border we recognised one soldier wearing a machine gun who was observing our group. Then we had to pass through a checkpoint because we wanted to visit one of the Palestinian inhabitants right next to the market street. Many young soldiers were standing next to us. To me, they looked like teenagers despite the huge deadly weapons in their hands. We arrived at a crossover and chose to take the shorter way on the left as a matter of course. But immediately, when we tried to move to the left, two soldiers stopped us and told us that it is not allowed for Muslims to use this street. So, we took the street on the right and a few of us started to cry because it felt so unfair and discriminatory that some of us were not allowed to use this street only due to their religion. An old Israeli settler ran towards us and started screaming at us and the soldiers. We could not understand what he was shouting because he spoke Hebrew. He especially stepped up to a Palestinian member of our group and planted himself in front of him very aggressively. But our guide stood calm and just looked him in the eyes. One of the soldiers half-heartedly tried to calm the settler with one hand on his shoulder. Still, the old man continued and ran towards one of our girls who had just arrived and was not aware of the dangerous situation. Gladly, nothing happened to her. After this emotional situation, many different cars with Israeli licence plates drove by. Anne told us that in this kind of place only Israelis are allowed to use cars. On our further way to the house of the inhabitant, a car stopped abruptly and a settler told us: “Welcome to Israel!”. He spoke of his opinion on settlements and tried to show us his approval of a peaceful solution. Some soldiers wanted to step between us, but he quieted them down. Although he lived in a settlement established on the territory planned for a Palestinian state according to the Two-state solution, he told us he was a supporter of it. After that, we had to use a very rocky road with lots of trash. Right next to us, there was a high fence through which we could see a tarred and tidy street with the same direction. On this one, Palestinians are forbidden to walk upon, though. When we arrived at the house of the inhabitant, we went to his roof and got some water and mocha. 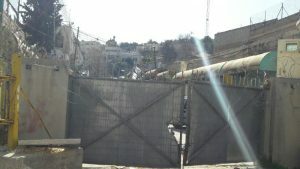 After a while, we went to the Ibrahimi mosque where we had to pass another Israeli security station. We had to show our passports and the Palestinian members of our group had to answer a few questions like where they were from. Renad answered that she was from here, from Palestine. The soldier answered that he had never heard of it and gloated, when he pointed to her ID which did say nowhere “State of Palestine”. The mosque was really huge and we could see a lot of Muslims praying. On our way back to the travel bus, we saw children hitting a donkey with sticks. We tried to stop them, but it only worked for a moment. For us, this underlined the effect the omnipotent violence had on the new generation of children. They grow up in horrible circumstances of oppression and never lived an autonomous and peaceful life like ours. We walked back to our travel bus, passing the market street again. It was getting dark and the street was completely empty. Every shop was closed and the street was dark, giving some of us chills. But when we walked to the centre of the city it didn’t feel like being in a ghost town anymore because there were lots of people. 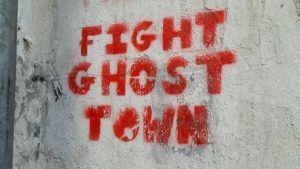 By now, we could understand why someone had written “FIGHT GHOST TOWN” on the walls. After this long day, all of us were very tired. We had received a lot of different impressions of Palestine. On the one hand, we saw how inhumane the lives of Palestinians under military occupation are and how Muslim as well as non-Muslim Palestinians are discriminated against. But on the other hand, we could also get to know how resilient and brave a lot of Palestinians were dealing with this situation of oppression.